PROFILE have an excellent track record in health and safety and has many accreditations, thus providing evidence that the Company has the necessary systems to carry out works safely, following audited policies and procedures. Health and Safety issues are therefore of paramount importance. It is a joint obligation between the contractor and the client to comply with all legal requirements. PROFILE adheres to the Health and Safety at Work Act, Working at Height and Construction Design and Management Regulations. When our trained surveyors carry out a survey the following items are taken into consideration. If applicable, these items will be provided and quoted for in our Specification and Quotation. 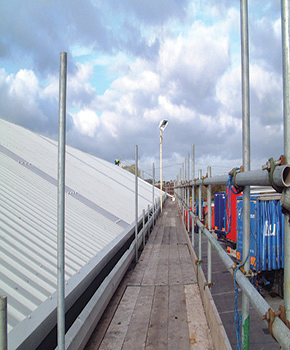 Roof Access Requirements – All types of scaffolding to suit each individual contract can be provided. 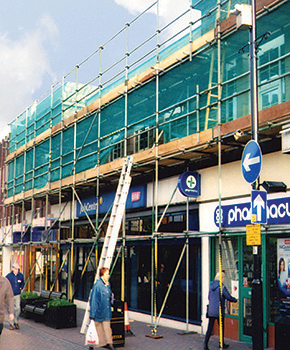 This would include full edge protection or full boarded scaffolding protection, scaffolding towers, scissor lifts, telescopic booms, walkway systems, light weight stagings and all types of fall and arrest systems. 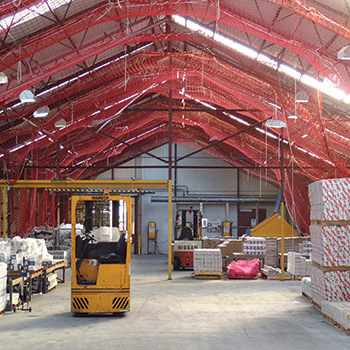 Safety Netting – Full and partial safety netting. Debris netting within the safety netting is also an option. PPE (Personal Protective Equipment) – G Stops and harnesses to be worn by operatives, high visibility jackets, safety boots, gloves, overalls, respiratory masks and helmets. All on site regulations will be complied with. Air Monitoring – When carrying out the removal of asbestos cement fibre roof sheeting, air monitoring tests will be provided by an approved health and safety contractor. Sample Asbestos Analysis – Prior to carrying out works on asbestos cement fibre sheeting, it is a legal requirement to obtain a laboratory analysis of the asbestos to be removed. Fire Protection – Hot working regulations are complied with when using bitumen boilers and torch on guns. Our company vehicles carry fire extinguishers. External Health and Safety Consultants – PROFILE engage the services of an external Health and Safety Consultancy. The assistance includes updating our Company health and safety policy and associated documentation. Site visits, site audits, assistance with risk assessments, training courses, tool box talks and a 24-hour on call service for advice with the legislation is provided. Site Health and Safety Documentation – On each contract an on-site handover is conducted by the Contracts Manager to ensure that all aspects of the contract are fully understood. Site Safety Induction Forms, Health and Safety Site Handover Forms are therefore completed at the beginning of each contract. Site Audits are carried out during the project to ensure that best practice and Company health and safety procedures are followed. Method Statements and Risk Assessments are issued to clients for approval and to the Foreman and Operatives, prior to project commencement.